Cornelius Van Til (May 3, 1895 – April 17, 1987), born in Grootegast, the Netherlands, was a Christian philosopher, Reformed theologian, and presuppositional apologist. 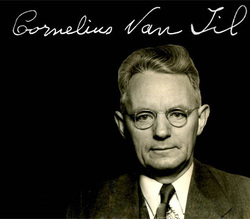 Van Til (born Kornelis van Til) was the sixth son of Ite van Til, a dairy farmer, and his wife Klasina van der Veen in Grootegast, Holland. At the age of ten, he moved with his family to Highland, Indiana. He was the first of his family to receive a higher education. In 1914 he attended Calvin Preparatory School, graduated from Calvin College, and attended one year at Calvin Theological Seminary, where he studied under Louis Berkhof, but he transferred to Princeton Theological Seminary and later graduated with his PhD from Princeton University. He began teaching at Princeton Seminary, but shortly went with the conservative group that founded Westminster Theological Seminary, where he taught for forty-three years of his life. He taught apologetics and systematic theology there until his retirement in 1972 and continued to teach occasionally until 1979. He was also a minister in the Orthodox Presbyterian Church from the 1930s until his death in 1987.